Carole Ione Lewis, also known as Ione, is an author, playwright and poet whose works include Pride of Family; Four Generations of American Women of Color (New York: Harlem Moon Classics / Broadway Books, 2004); Nile Night; Remembered Texts from the Deep, (New York: Deep Listening Publications, 2008), and Listening in Dreams: This is a Dream! (New York: Ministry of Maåt Publications 2007). She is playwright and director of Njinga the Queen King; The Return of a Warrior and the dance opera Io and Her and the Trouble with Him. She is currently writing a sequel to her memoir, Pride of Family. 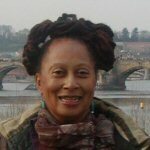 Ione is Artistic Director of Deep Listening Institute, Ltd. and Director of the Ministry of Maåt, Inc.